German painter and astronomer; born at Frankfort-on-the-Main June 17, 1802; died at Fontainebleau Sept. 10, 1866. Destined originally for a commercial career, he spent a dozen years in his father's warehouse, devoting, however, his leisure to painting. At length he repaired to Munich, where he studied under Cornelius and Schnorr. In 1836 he settled in Paris, and exhibited his first picture, "Woman in Algerian Costume." This was followed by many others until Goldschmidt became famous as a historical painter. One of his later works was the "Death of Romeo and Juliet" (1857). 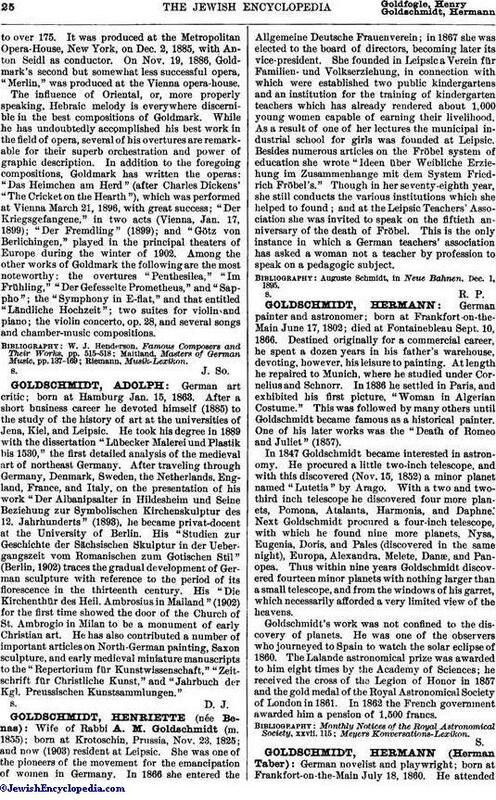 In 1847 Goldschmidt became interested in astronomy. He procured a little two-inch telescope, and with this discovered (Nov. 15, 1852) a minor planet named "Lutetia" by Arago. With a two and two-third inch telescope he discovered four more planets, Pomona, Atalanta, Harmonia, and Daphne. Next Goldschmidt procured a four-inch telescope, with which he found nine more planets, Nysa, Eugenia, Doris, and Pales (discovered in the same night), Europa, Alexandra, Melete, Danæ, and Panopea. Thus within nine years Goldschmidt discovered fourteen minor planets with nothing larger than a small telescope, and from the windows of his garret, which necessarily afforded a very limited view of the heavens. Goldschmidt's work was not confined to the discovery of planets. He was one of the observers who journeyed to Spain to watch the solar eclipse of 1860. The Lalande astronomical prize was awarded to him eight times by the Academy of Sciences; he received the cross of the Legion of Honor in 1857 and the gold medal of the Royal Astronomical Society of London in 1861. In 1862 the French government awarded him a pension of 1,500 francs.